Work with pest varieties of wood to create wonderfully unique pieces for your home. 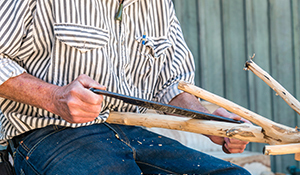 Making rustic furniture from branches and sticks is an old practice, usually associated with making do, and the simple life. It is also a very creative and practical way to use larger garden cuttings, as well as pest varieties such as camphor laurel and privet, that would otherwise be thrown away. Andrew MacDonald (pictured) worked as a furniture maker before studying sculpture and his art practice combines the practical knowledge and skills of a tradesman with originality and creative design. He has exhibited his pieces in galleries throughout the world. Many of the tools Andrew uses are traditional ones, rarely seen in modern workshops, many of which he has made himself. It easy! Choose the workshop and date that suits you best and then give us a call on +61 (0) 7 4659 4900. Please see our Terms and Conditions (188 KB) .